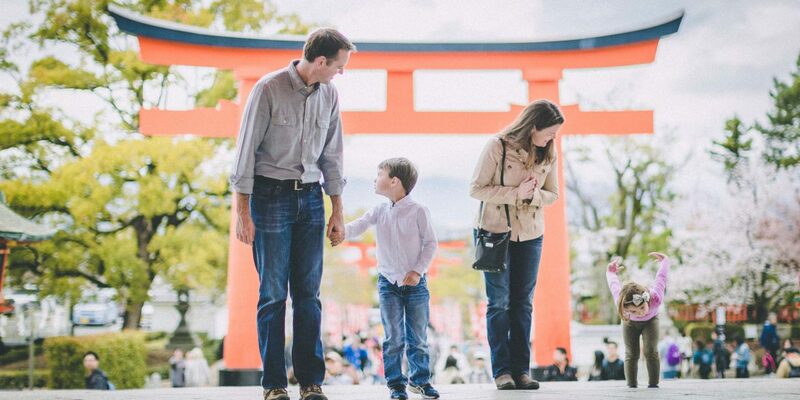 This adorable family of four ventures out on international travels as often as possible. This year, they were able to see Kyoto and visit some of its amazing religious structures. Here are the best shrines and temples to visit in Kyoto. Recognizable by a seemingly endless tunnel of torii, traditional Japanese gates, which lead to the inner shrine, Fushimi Inari-taisha sits at the base of a mountain. Walking trails lead to a series of smaller shrines up the mountain, so wear your hiking shoes if you plan to visit them. Rokuon-ji is one of the most popular Zen Buddhist temples in Kyoto. And it’s no wonder with its Golden Pavilion covered with pure gold leaf. The stunning surrounding gardens are worth a wander and incorporate a “mirror” pond which reflects the dazzling temple. This Buddhist temple offers English-speaking tours during which you can ladle healing water from the temple’s waterfall. Tour participants at Kiyomizu-dera are allowed into the inner shrine, an honour generally reserved only for devotees. The tour offers the unique opportunity to learn from a Buddhist monk and to ask any questions you may have about the practice and the temple. As with most temples, arrive early to avoid large crowds. Sanjusangen-do is a Buddhist temple famous for its 1,001 carved wooden statues of Kannon, the Buddhist goddess of mercy. You’re not allowed to take pictures, so you’ll get to enjoy the thrill of discovery and feel like you’re in on one of the world’s little secrets once you’ve seen it for yourself. This quirky off the beaten path monument is basically a giant rock with a hole in the middle. Its appearance has shifted through the years with the addition of strips of paper with wishes written on them covering the entire monument. Here’s how it works: if you want to end, begin or even strengthen a relationship, visit the inner sanctuary of the temple. Then, write down your wish and walk through the power stone monument with wish in hand. Finally, add your wish to the monument. This temple is not a major tourist attraction, so you’ll completely avoid crowds and come home with an interesting travel experience!